One of the new frontiers for cannabis investing may not be the frothy windfall that some companies are expecting, a new report suggests. The opportunity for cannabidiol – the cannabis compound du jour that’s better known as CBD – in Europe is forecast to grow at a heady clip over the next several years, but the continent is rife with a complex regulatory patchwork that could make the sector difficult to navigate, according to Bethany Gomez, managing director at Brightfield Group, which released a report Tuesday analyzing Europe's legal CBD market. "Europe is a very nascent cannabis market," Gomez said in a phone interview with BNN Bloomberg. "It’s just starting to take off but tailwinds are there." Easing medical marijuana laws throughout Europe have spurred several major Canadian cannabis producers to invest in more than a dozen countries across the continent. Companies such as Aurora Cannabis Inc. (ACB.TO), Tilray Inc. (TLRY.O), Organigram Holdings Inc. (OGI.V), and Canopy Growth Corp. (WEED.TO) have spent millions of dollars acquiring licenses to operate in European countries and built cultivation facilities to tap the burgeoning market. Brightfield said consumer spending in Europe’s CBD market was estimated to be US$318 million last year and could grow to nearly US$1.7 billion by 2023, based on increased awareness of new cannabis-infused products and a streamlined regulatory regime. But Gomez notes that kind of growth is expected to be more gradual than other markets such as Canada and the U.S. 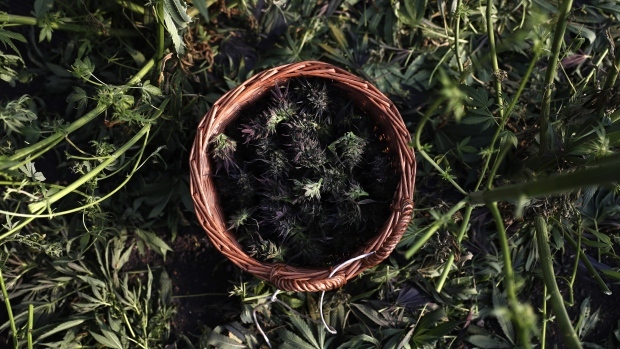 Global spending on CBD, which has emerged as a popular ingredient in consumer goods ranging from cosmetics to beverages, is expected to reach as high as US$16 billion by 2025, according to investment research firm Cowen Inc.
After more than a century of prohibition, allowing CBD use has also become a more palatable way for lawmakers around the world to loosen cannabis rules as the compound delivers some of the effects of marijuana without getting high from tetrahydrocannabinol (THC). The World Health Organization recommended in January that CBD no longer be subject to international control, although a formal vote by the United Nations to ratify the policy change has yet to take place. In Europe, CBD products are limited to "external use" such as topicals, due to the European Commission's "Novel Food" regulations on the compound. An amendment proposed by the European Food Safety Agency to include CBD in ingestible products could pass by the end of the year. "The opportunities in Europe are much longer term in nature," Gomez said. "There’s some appetite for medical marijuana being subsidized by insurance companies, but that’s something that would happen over the long term. Europe is more incremental in nature and they’re not in that big of a hurry to legalize." Gomez added the perceived international opportunity for CBD may be "overblown" by companies, which may be caught in the hype of the trendy ingredient. The fragmented nature of Europe's countries means that CBD is consumed in a variety of ways that would make a scalable business difficult to operate. For example, France treats CBD goods as a pharmaceutical product while Switzerland consumers purchase CBD as a tobacco substitute, Gomez said. "Every market is approaching this differently," she said. "Investors and companies should be really cognizant of not getting swept away with the hype and making sure that they really understand these nuances and what the market is going to look like."